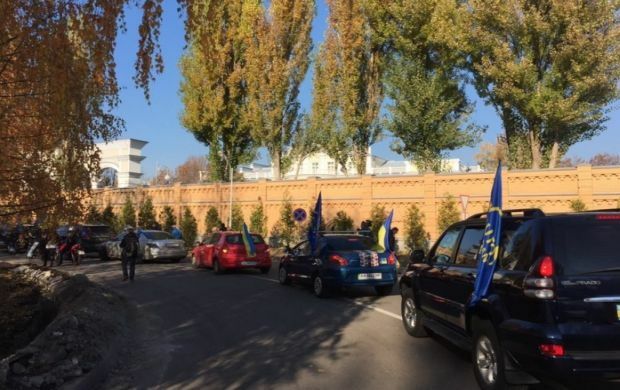 The activists of so-called Auto-Maidan movement in nearly 100 vehicles drove up to the mansion where Ukrainian President Petro Poroshenko resides, to hold a picket demanding resignation of Prosecutor General Viktor Shokin. According to MP Ihor Lutsenko, as of 12:30, 93 vehicles of Auto-Maidan activists gathered outside the President’s mansion. He added that the law enforcers blocked the driveway leading to the residence with a bus. "The bus drove off, in response to our compelling requests," said Lutsenko. As UNIAN reported earlier, the veterans of the Donbas battalion are planning to join the rally.